Every individual worksite comes with its own set of complications. One challenge that can increase the complexity of your project is the presence of pollution or contaminants. When a site is known to be contaminated, it may be required to go through a process of remediation by law. Remediation is the act of restoring soil to a safe, stable, and consistent state that is ecologically friendly. This can often be an expensive and time consuming process that adds difficulty to your project depending on the type of contaminant in the soil and the proliferation of contamination. These factors influence the severity of contamination and can help you determine the best course of action to remediate the soil so that development can proceed. Alpine provides a wide variety of soil remediation equipment that is designed to simplify the neutralization of contaminants. 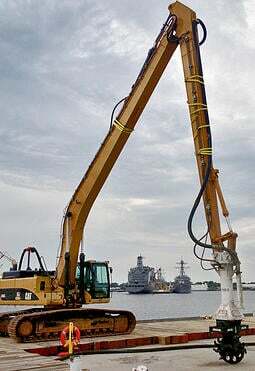 Our soil remediation equipment comes with options and customizations that provide you with the ability to select exactly the tools you need to complete the job. If your project is a small one and you do not anticipate the need for your own soil remediation equipment, we also offer rentals. Whether you are looking to rent or buy, Alpine has the solution to your soil remediation needs. One standard set of soil remediation equipment Alpine provides are powerful rock and concrete cutting tools that have been repurposed for soil mixing, remediation, and stabilization. These powerful tools are extremely useful for soil mixing which can help neutralize even some of the most volatile organic compounds. These soil remediation mixing tools eliminate wasted time and make the process of soil mixing more efficient. One of the best features of our soil remediation equipment is its level of customizability. Whatever your situation calls for, Alpine provides a variety of options and customizations to meet your needs. From transverse mixers and axial mixers, to drum lacing and mixing paddle layout, Alpine has it all. Our company also has equipment for specific problems, such as container mixing or work in lined ponds or work areas where puncturing could be an issue. If puncturing needs to be avoided, soil remediation equipment can be paired with depth limiters and bumpers to ensure that puncturing does not occur. Another special circumstance could call for the use of wet amendments. 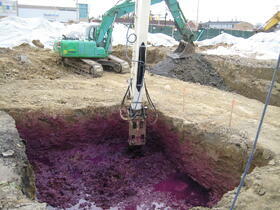 We provide soil remediation equipment with additive injection piping that is suitable for both wet and dry amendments. The use of Alpine soil remediation equipment can greatly reduce your project cost by keeping soil remediation on-site. By removing the need for transportation, your project can proceed efficiently and cost effectively. The majority of Alpine equipment can simply be attached to standard excavators, backhoes, and skid steer loaders which prevents the need to purchase any other special equipment. If your worksite is contaminated, contact Alpine today to find the right soil remediation equipment to take care of your contamination in situ. Alpine's partnership with researchers at the Pennsylvania State University continues into 2014 as we continue to improve our soil mixer designs. Using numerical modeling and particle tracing, the research team at PSU has simulated the complex interaction between fluid-solid mixtures and mixing tools in order to evaluate torque demand, mixing quality, and drum geometry. The images on the right show a time-lapse animated model at different views, which indicate how particles move within a substrate with a specific soil pick configuration. These models are run with different drum configuratuions to compare how the particles move and disperse. What this means for you: we're still digging into complex models to provide the most efficient, cost-effective and thorough mixing tools on the market. Alpine's partnership with researchers at the Pennsylvania State University continues into 2014 as we continue to improve our soil mixer designs. Using numerical modeling and particle tracing we're simulating the complex interaction between fluid-solid mixtures and mixing tools in order to evaluate torque demand, mixing quality, and drum geometry. The results of these analyses will help Alpine continue to offer the most efficient soil mixing and soil remediation equipment in the world! This animations illustrates the complex interactions between particles in a soil substrate and our TM series soil mixing attachments. We work with key members of the Pennsylvania marcellus shale industry on a regular basis. From pipeline trenching to soil remediation, we find it incredibly important to keep an eye on the latest happenings in the industry. Alpine mixers are trusted in the most challenging of soil remediation applications.